I am new here ( and Dutch : ), so please forgive my simple approach to the matter of getting the full potentcial out of MIDI controllers and where to look on this site for the right basic information about this subject. Can somebody help me out and give me a good link to the A B C of MIDI mapping for DJ gear to start with , I would be very thankful for that . I did found some bits and pieces about it myself so now and then ,but that is peanuts to what I see what is going on on this forum. I hope that I can find out more by -reading first- what goes on in the computer /software when the different commands are send over and forth , and which 'language' is used besides a glimpse at MIDI-OX (before I try to discribe what difficulties I did encounter due to the lack of my knowledge about the MIDI protocol : ). MIDI learn has made it much easier, but as I experience it it is not always as promising as advertised. Thereby I would like to know what is going on as much as it can, and for instance find out how much touch sensitivity can be manipulated ,or indentify what in some cases causes certain uncontrolled behaviour of such parts of the hardware. Hello and Welcome to Forums! Thank you for your message and offer to help me out as far . I know this is a bit on the down side for performance,but for bedroomDJ practice it works for me (as far as I can see). Several years ago I started also spinning digital with the EKS Otus that came with Traktor Le in that time. In that Le version the controller works well , except the X Y trackpad on the deck /in the software/on the computer screen is reacting a bit uncontrolled. This is one of the reasons that I would like to know more about this hardware part and how it is communicating with the computer and software, to see if it can be fixed. Something in the same order I notice with my "new" Stanton SCS 3D controller in VirtualDJ8 . One touchstrip slider is mapped with a differend action in VDJ8 compared to the Stanton SCS 3D Generic Preset . With the function as Seek/Navigate Through Track to .5. slider 1 in VDJ 8 it is in my opinion to coarse and it feels it has that same 'static like' reaction touching it as that I notice on the X Y trackpad on the EKS Otus . Of course this touchstrip can not be compared to one that is on a CDJ 2000 or equivalent , it is much shorter too to begin with. Slider 2 has several nice functions mapped to it though , but that is still all 'under the hood' for me . RekordboxDJ is software that I also would like to explore with mapping (as far as one can dive in these programs) . I could mention so much more that is not clear to me yet with MIDI mapping and other variants of communication that I would like to make my own from basic level on. I couldn't find any info on EKS otus midi mapping... But those kind of XY pads are usually sending out two different "absolute" messages. So if your software parameter is expecting the "relative" message than there could be noticeable conflicts because those are two different midi events. I don't use other DJ software than Traktor so I can not really help you with that... In Traktor this can be adjusted with available interaction modes. Maybe there are similar settings in other software that you use. Also check if that hardware comes with some kind of controller editor software. SCS 3D touch strip bug indeed sounds like the same issue. Again this is something you should check in VDJ mapping interface. Thanks for your reply and the link to MIDI Basics . That is a nice addition to the info that I gathered until so far. I my search for more information to get informed what is going on behind the MIDI Learn button and what more is possible to fine tune, I even once asked the Dutch Interface magazine Q&A if they had links for me for self study when I was (and still am : ) struggling with my EKS Otus to get it mapped in TP2 . I found that very helpful as a start. I know , I should follow (an very expensive long) course to learn more about MIDI. But on the other hand ,there is so much one could learn by tutorials , articles and forums on internet for free, in your own time and tempo ; although I did not stumbled on it yet that takes you up from the very basics on. customers ( plug and play and MIDI Learn is a good development these days though ). For some, the fun of succes would mean getting more involved with expansion of gear I think. The X Y trackpad sending out absolute ( CC ) massages like in a X Y Diagram I can follow . If I would compare that ( in theory , 'sort of reverse combined') with two MIDI potentiometers for absolute CC, and in an other situation one or maybe more endless rotary encoders for relative CC , am I right then ? I did not use MIDI-OX to read out what movement the X Y trackpad leaves behind when I for instance make a diagonal movement on this EKS Otus deck, and then maybe compare it to a trackpad on an other device that has one and functions smootly. Now I even ask myself if that (trackpad )part of the EKS Otus isn't sending out HID , because it is also functioning in other situations just like a normal trackpad or mouse ( and also in conjunction if I use an additional mouse ) when Traktor is 'made smaller'/ running in the background. EKS has a reputation, and I think that they well knew how to select a X Y Trackpad on such a controller in comparison to the other parts on the deck. If possible , how can this X Y Trackpad be "tamed" in Traktor ; or what could be the cause of it not being as precieze as any other trackpad /mouse ? At least I can see what happens in the video what has to be programmed /altered ( when it concerns a relative signal that a specific jogwheel produces in that DJ software ) to get the most ,or any, use in that way of a MIDI controller that is not plug and play. For me it is like learning how to read and write the first time this way , and I am sure several DJ software brands are using their own 'codec' to finetune such signals. It is information that I was looking for so long ; although I 'get it' maybe for 10 % now at the moment how to detect and (re)write a mapping like that. I might be very basic for a lot of U . I hope that someone maybe has a guidline how to go on from here in Traktor , Virtual DJ and Rekordbox DJ. The EKS Otus had the EKS MIDI Agent controller editor software to it that has several pre mappings for Traktor up to 1.2 , Deckadance , Generic and VirtualDJ . I sure would like to get familiar with it . This Stanton SCS 3D that I got hold of lately has also a controller editor software for it : DaRouter ,but I have not looked in to it yet , and don't know if these legacy products can be used in today's versions of PC and DJ software. I think better forget to try improve the use of that (short )S1 touchstrip slider for Seek/Navigate through Track in VDJ8 , and live with it until I can find out if /how I can map this with a modifier button or so to the circular C1 touchstrip slider. In Stanton SCS 3D Generic presets I see that the S4 touchstrip slider can send absolute (FX, EQ) and relative (Vinyl , Deck) as well when a different deck mode is pressed. I wonder if these two controller editor software programs can be entered so deep to set finer/the right increments for touchstrips, trackpads , or maybe even the jogwheel. On my laptop , when I use my X Y trackpad in the DJ software, it (almost ) is on the spot when I hover and click ,or say, adjust the tempo on the screen , and also does not change position when I remove my finger from the trackpad. Isn't there a sort documentation (on the market ), that handles these alterations/modifcations and corresponding protocols that come with it that is written in laymen's terms , that anybody know of ? That is actually a pretty cool feature. My guess is that trackpad is low resolution but I could be wrong. Maybe you can record a quick vid and post it here to show us it's behavior in Fader-Direct mode. You can also map it as a Fader-Relative mode. This way you will lose the absolute message type but gain precision by lowering the rotary acceleration percentage. Whit a help of one toggle type Modifier button you can have both messages mapped in so you can use absolute message for effects like Beatmasher, Gater Delay, LFO, Slicer which have the rate parameter fixed to certain values om the midi range. And use the relative mode for Filters, Reverbs, sweeps or any other parameter that you want to adjust smoothly. It is always nice to have those kind of editors if you are mapping controllers in software which isn't supported with strong midi mapping interface. For example you can adjust many of those same settings in Traktor's Controller Manager but you might not get that lucky with basic mapping interface of Ableton Live. Long live Remotify! I don't think so. HID have greater resolution than MIDI. We have to wait for MIDI 2.0 to see if it'll match up. Thanks for your reply Stewe. Thereby starting to mention on this site what this 'bug like' behavior of/on my EKS Otus controller in TP maybe could be, and how it possibly could be solved, is not the easiest for me (and others to follow) at times that I try to make a picture of the situation of the problem . With the sort of pressure that I face to make some sence ,as I am trying it to expain it to others in this tread, I am much more motivated though to get better in what I wanted to learn more about for so long now ; often taking steps back to try not to begin with the wrong assumptions and understanding of the theory , sorry for that . To start with , this X Y Trackpad dating from the early 2000's is a basic one (6 cm by 4,5 cm WxH ) without multitouch function , there are two pushbuttons under them like most ones . Maybe I will make that video of the behavior of the pointer of the X Y Trackpad in TP and and in other programs when TP is running in the background after mentioning some more details ( if I can manage to do that myself and on this site ). I opened MIDI-OX and saw no MIDI messages send when I used the X Y Trackpad on the EKS Otus . You can see the CTRL MIDI INDICATOR light up when I press the left button under the X Y Trackpad when I for instance am on play deck A with the pointer in the DAW , just as when I use the trackpad on my laptop. CTRL only lights up on certain funtions in TP , as it does with pressing left button with any other trackpad or mouse. The right button under the X Y Trackpad on the Otus opens dialogs at the normal places on the DAW , just as if you use the Trackpad on the Laptop or a mouse , but none do light up CTRL then . Touching the X Y surface doesn't light up CTRL also . Now I come to the heart of the problem that is much more present in TP then in other programs . When I navigate with the pointer (by the X Y surface on the Otus ) on certain functions in TP , like on one of the large FX button, sometimes the pointer jumps back one centimeter or so from that spot ( as I take my finger off the pad and want to press the left button under the X Y Trackpad to activate the FX ) . This behaviour of the pointer is no fun to play with . If I want to use the pointer and click the function for the + or - from headphone gain or so ,which are also a little harder to navigate to (in comparison to when I do that via my laptop ), I get the same sometimes ,that the pointer will not stay in that small + or - box. For me it is hard to imagine what causes this , but leaving at it is is a bit frustrating ( while all the other controls on the Otus work so well ) 'better' avoiding this precious space on the deck. These suggestions for possible absolute - and relative messages use for different functions in TP by one toggle Modifier button are great ! If it is possible in one way or the other I sure want to learn how to program that . 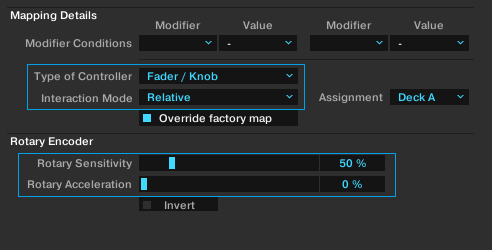 To find a X Y signal or existing MIDI message in the factory mapping /pre mapping for EKS Otus in TP is a major task for me , and changing it into the Fader Direct or Relative Interaction Mode even a bigger task . The fact that I don't see MIDI -OX responding and show MIDI data , along the other data I see with the Otus being analized, makes this much harder to imagine what I would be up to. It would be nice if the X Y Trackpad pointer signal send of the Otus was stable and there were dialog boxes showing up , like in Traktor DJ app for FX or something simular. Maybe plug in type of programs or alike do exisist for customizing and visualisation. and (almost) everything works fine . It is always possible to use a wireless mouse besides the X Y Trackpad on the Otus and laptop that can be used side by side , but leaving the space of the X Y Trackpad as (sometimes )almost unusable it is on the deck is a waste and creates physical delay to react in my opinion. I wonder how other EKS Otus users experience this navigation with the pointer . I opened MIDI-OX and saw no MIDI messages send when I used the X Y Trackpad on the EKS Otus. This indicates that the track pad is not midi mapable. It is probably a low quality track pad... Simple as that bro. Not the best quality Trackpad by today's standards I would rather say. I tried to find more info about it in the control panel - settings of my laptop , and now I want to visit a computer shop on occasion to ask them about it . Making a video of this 'uncontrolled behaviour' with my phone became not clear enough to get both the deck Trackpad and the DAW in one picture . I first have to find out more how to make video's with an image in screenshot (something like they use in tutorials ) ,if this problem might be solved and could be helpful for others . What better then an ergonomic MIDI/HID controller that works well and is smooth to operate ? I know , some issues come in the first place by the type of hardware component that is used . That I can imagine.